Fun Subway Doodle from the Subway Doodle Blog, where this guy sez "I draw on the subway on an iPad"
Pinocchio looks as though he's somehow confused Puppetworks with Pleasure Island... Smoking something out front while being manipulated by the giant who lives over the famous Park Slope, Brooklyn theater. 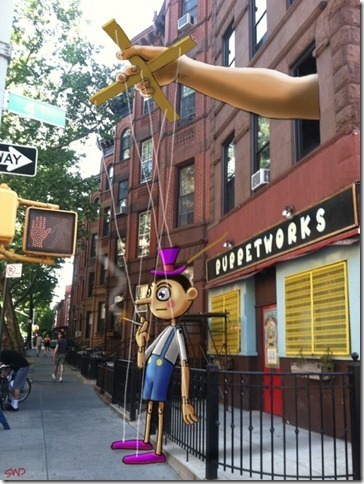 Here's the permalink to the specific post titled Hanging Out in Front of Puppetworks in Park Slope. Here's a link to an earlier Pinocchio Museum post about Puppetworks. Here's more on the mystery blogger doodler from the About section of his blog: I take pictures with my iPad camera and then doodle over the photos. I do most of my drawing while commuting on the subway. I use the “Brushes” app and a stylus. When I lose the stylus, I use my finger. When I’m not drawing on my iPad, I’m playing with my kids or working as an art director at a major cable network. Follow him on Twitter @SubwayDoodle. I do!